The sub £200 monitor market is a crowded space so it takes something special to stand out from the crowd. 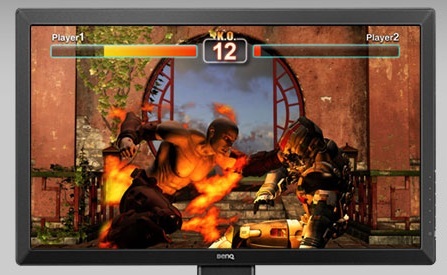 Enter Benq’s latest Gaming Monitor, the RL2460HT. This is a 24″ 1920×1080 TN display with backlit LED and a 60Hz refresh rate. As per the other gaming monitors in Benq’s range, it doesn’t go over-the-top with styling, finished in matt black with just a small hint of red around the base. Bezels are thicker than some of the other gaming monitors out there and the feel of the monitor overall is a little chunky but certainly not unlikable. From the front it looks both classy and discrete. The design features low level command icons on the right hand bezel which correspond to good sized buttons on the right edge which are easy to find. One of the issues I have with some modern monitors is the position of the on/off button, the RL2460RT had no such issues and a nice subtle light to show its status. Other buttons are close together but with enough gap to find each one without looking. The stand is well thought out, allowing for a lot of movement vertically and even a measurement system for the height. Connections are standard HDMI In x2, D-sub/VGA and a DVI-D port but no DisplayPort, which is worth noting for those running multiple-monitor setups. What sets this apart is the HDMI Out, used primarily for video capture to avoid lag when gaming, which usually occurs when the device is placed between the PC and the monitor. It’s a great idea that should appeal to the many Youtube and Twitch gamers out there. There are, alas, no USB ports on the side, unlike many of the other new Benq monitors, but it helps to keep the monitor uncluttered. On first use it’s obvious that this monitor is set up for gaming. Colours pop and games look smooth and ghost-free. The Flickerfree technology is there in the background and having used the monitor for hours on end, it certainly feels better on my eyes. I’d go as far as saying this has one of the best pictures I’ve seen on a 1080p display, helped by the fact that this has the older (but still superior in picture quality) TN screen technology behind it. In fact, the only issue seems to be a slight discolouration at severe viewing angles, but it’s nothing to be concerned about if you’re using this normally. Obviously it’s not going to match those 144hz refreshes of the higher end IPS screens, but the Benq RL2460HT does perfectly well at 60hz and only enthusiasts with the money to spend would feel as if they were missing out after seeing how good the colour reproduction and smooth image movement are. If you’re looking for a good priced gaming monitor that features low response times, a great picture with the promise of zero flickering then I can honestly recommend this TN panel. New Metal Gear Game announced….